The lovely plant you see above has special magic powers. Its INCI name is Saponaria Officinalis. If you're a language buff, you probably know that Saponaria is from the Latin 'sapo' which means soap. 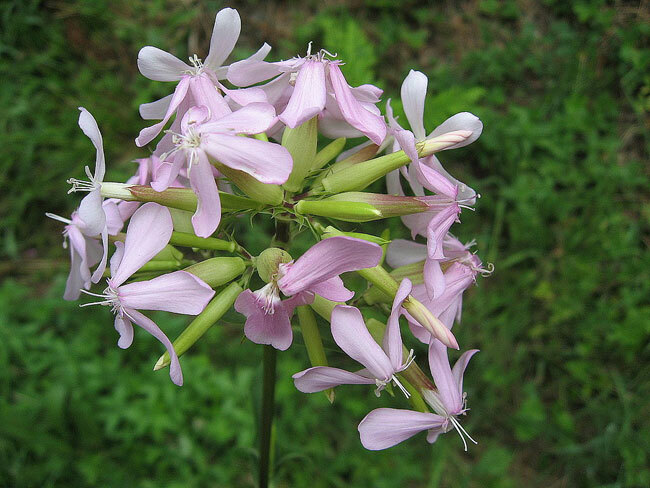 The common name for this plant is soaproot (or soapwort). 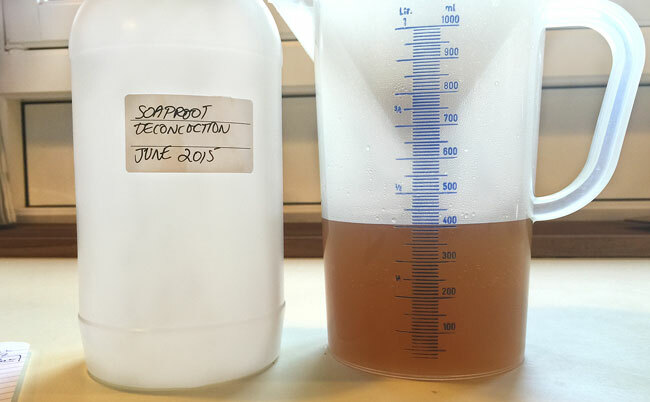 The reason for this name is quite simple: the leaves and roots of the soaproot plant have built-in soapiness qualities due to their natural content of saponins (up to 20% while the plant is flowering). We're going to extract the soapiness from soaproot today. Unlike an infusion – which is made by pouring boiling water over the dried flowers or leaves of a plant and letting it steep for a period of time, a decoction is used to extract the water-soluble actives from woody parts of plants (like twigs or roots). In short, a decoction is a kind of 'long-term' infusion that involves simmering on a stovetop. 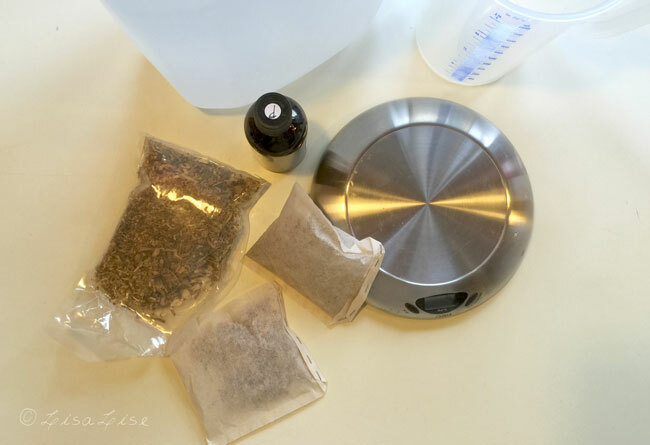 It's easy as making a cup of tea, but requires a bit more equipment and time. Tip: Expect to loose some of the liquid during the simmering time. To minimize this, don't be tempted to lift the lid to check on your decoction. 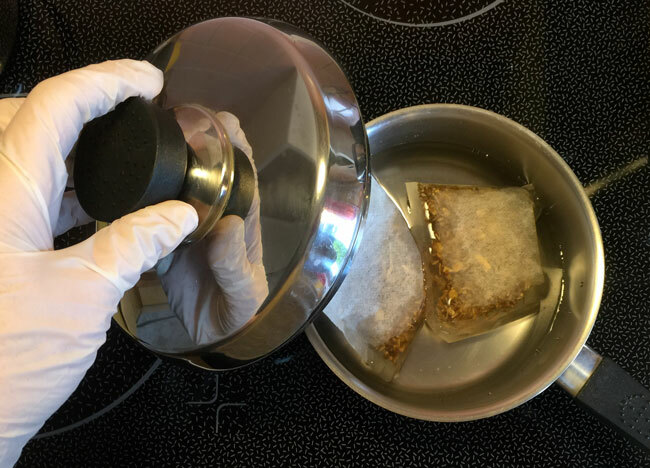 Although the herbs will soak up some of the water, lifting the saucepan lid is the fastest way to loose product. Just to Show You: This batch started out with 500ml of water and ended up with just over 400ml. (I did 2 lid lifts to photograph – that was enough to loose about 10ml). Here's the mixture just before the final few drops ran through the filter. The final yield here was about 410 ml. Tip: Don't trust your memory when it comes to making infusions, extracts, decoctions or any other product you plan to use over a period of time. Always add a label with date. Finally, I did a pH check – this decoction has a skin-friendly pH of 5.7. Sight: It does bear mentioning that we are talking about a liquid made from dried roots and twigs, so, the color is what it is – a little reminiscent of weak tea. If the mere sight of using a brown liquid as a cleanser doesn't appeal to you, you may want to use this as only part of a formula, or consider packaging it in an opaque bottle. Scent: The best way I can describe this scent is 'down-home-earthy-clean' – a little like the old fashioned unscented soap your great grandmother used to use. Some folks love this kind of scent, while others would probably be more inclined to want to mask it. It's all down to personal preference. Plans include trying this as a face wash, shampoo and body wash. I promise to update. We're not done looking at plants with surfactant properties quite yet. Our next decoction will be with soapnuts. Stay tuned for more plant-soapiness fun! I'm wondering if this decoction would add enough surfactant properties to a hard soap shampoo bar recipe- replacing the water (for lye) with this? I haven't had luck with shampoo bars regardless of oils used & I assume it is the lack of surfactant - always leaves hair greasy over time. Thanks for the great post as always. I'll be waiting to hear how your soaproot products turn out! Hello Lise, I have been following you for some time and have never post to all your wonderfulness but today I felt the need to tell you that you are much appreciated around here and please continue to enlightening us with your awesomeness. I am a DIY person myself and you have helped and given me some great insight as well as information; thank you very much, Bertha.